Telesforo Perez 87 (Ted) of Greeley Colorado passed away on March 28, 2018 at Bonnell Nursing home, he was surrounded beloved family. 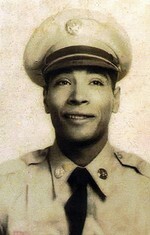 He was born on January 31, 1929 in Fort Worth Texas to Jose and Sara (Salazar) Perez. Ted was drafted in the Armed Forces, where he received the Good Conduct Medial and the National Defense Service Medial; in September 9, 1954 he was honorably discharged. On August 12, 1980, he married the love of his life, Dorothy (Allender) Perez in Pueblo, Colorado. He enjoyed spending time with his family and friends. Ted was a chef who loved cooking for everyone. He also had a talent for playing the guitar and singing, and he loved it. Ted was a loving father and grandfather, he was very proud of his family. Ted is survived by his children, Freddy, Teresa, Ricardo (Dorothy), Robert (Debbie), Lorie (Ben), Roy, and Yolanda (Carlos) Perez-Trujillo; numerous grandchildren, great-grandchildren, and great-great grandchildren; sister, Cruz Martinez-Perez; and a large loving extended family. He was preceded in death by his parents, Jose and Sara (Salazar) Perez; his wife, Dorothy (Allender) Perez; and son, Rudy Perez. To send flowers to the family of Telesforo Perez, please visit our Heartfelt Sympathies Store.